The Annual Easter Sunrise Service in Fountain Park will draw thousands of friendly neighbors in the early hours of what promises to be a beautiful, sunny spring morning. In this glorious setting, with the fountain providing a majestic backdrop, the Interdemoninational Service is conducted by a wide variety of the community’s religious leaders. It is the perfect way to lift up and celebrate the renewal of life. Area residents bring blankets, lawn chairs, mugs of warm coffee and copius amounts of cheerful handshakes and hugs to greet those they might have seen last week or last year. The service is lively with music, song and a message that reminds all of us of the presciousness of life. So set the alarm, roust your family and don’t worry about donning the fancy Easter clothes. 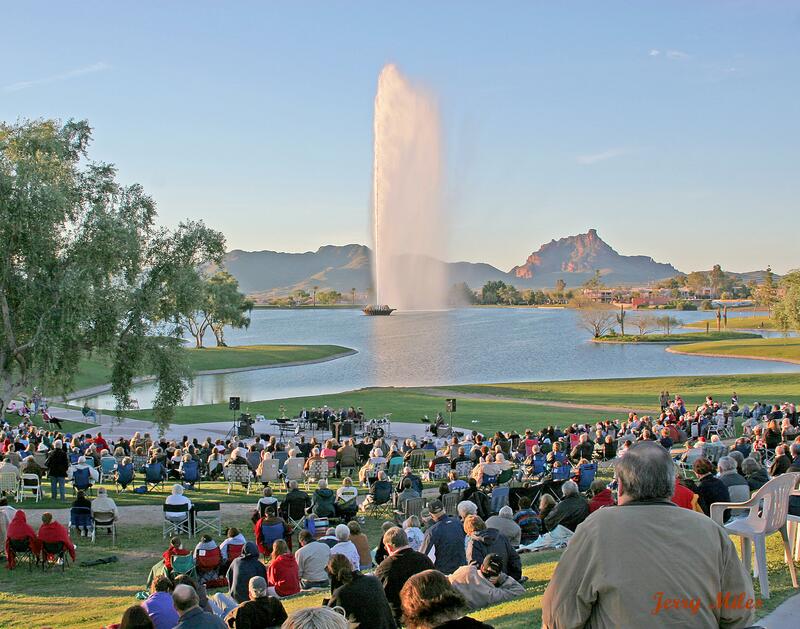 Dress warm and be on time–it moves fast and ends promptly–then enjoy the rest of your day in the charming hometown atmosphere that is Fountain Hills! Later, venture out to the pristine Sonoran Desert at McDowell Mountain Regional Park, for Ranger Amy’s old fashioned, Easter-Sunday Easter Egg Hunt. The little ones will have a ball at this 10:00 am event, and there are a variety of trails for older ones to take short or long hikes. Take a picnic brunch, plenty of beverages and enjoy the glorious spring morning! May the Blessings of Easter Be With You and Your Loved Ones! This entry was posted in Area Events, Mountain Trails, Scenery & Life and tagged Easter Sunrise Service, McDowell Mountains. Bookmark the permalink.